CBS 13 | BDN Police vehicles are seen in Lewiston in this CBS 13 file image. 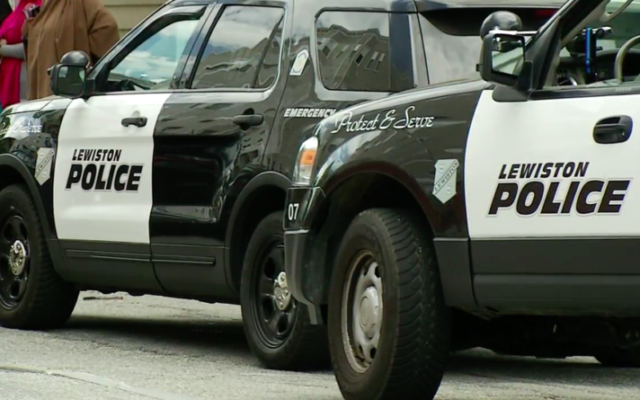 State police have arrested three people -- including two teenagers -- in connection with the death of a 38-year-old Lewiston man after a brawl there last June, a spokesman said Thursday. State police have arrested three people — including two teenagers — in connection with the death of a 38-year-old Lewiston man after a brawl there last June, a spokesman said Thursday. A 17-year-old male has been charged with manslaughter, while a 13-year-old male and 23-year-old Pierre Mousafiri have each been charged with misdemeanor assault, Stephen McCausland of the Maine Department of Public Safety said. The two teenagers, who are not identified because they are juveniles, will be held at Long Creek Correctional Facility in South Portland, while Mousafiri will be held at the Androscoggin County Jail in Auburn, he said. All three people are from Lewiston, although McCausland said the 17-year-old was taken into custody by state troopers in Limestone Thursday morning. The arrests come almost exactly 10 months after a deadly brawl on Knox Street began an apparent string of violent incidents in Maine’s second largest city, putting locals on edge while causing police to respond with increased patrols and strict enforcement of a park curfew. Donald Giusti died from injuries suffered in the fight, which police said at the time involved as many as two dozen people. Giusti’s family released a letter in January thanking city and police officials for their help, but also expressing concerns that no one had been charged still seven months later. McCausland said the 17-year-old will make his first court appearance in Lewiston District Court Friday at 1 p.m., while the 13-year-old would be appearing in court Thursday. Mousafiri is scheduled for arraignment on June 12, pending release on bail. “The arrests are the result of several months of investigation, which included multiple interviews, a thorough review of physical and electronic evidence seized in the case and after consulting with the Maine attorney general’s office, the office of chief medical examiner, Androscoggin District Attorney’s Office and the Juvenile Corrections Office,” McCausland said in a news release.